Samsung Members: How to Submit an Error Report? Samsung Members - How to Submit an Error Report? With the Samsung Members application you can submit an error report for troubleshooting your device. You can submit a report from issues such as slow device, overheating, system/settings, and much more. See below steps on how to submit an error report. 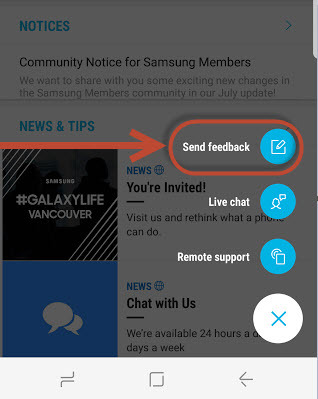 1 From the Samsung Members application tap on "?" 2 Once tapped on the "?" you will see the following items populate. Please select "Send Feedback". 3 Now you will be directed to "Send Feedback" screen where you can select "Error Reports". Tap on Error Reports. 4 A message will populate to log data stored in system. You can choose to "Always" send or "Just this time". We do recommend to be connected to Wi-Fi network depending on your mobile network plan. 5 Once you have selected system log data, you will be able to choose from category on what issue your device might be experiencing. Please choose from category to proceed with "Error Reports". 6 Lastly, please enter issue details and attach any screenshots you may have. Once complete, tap on "Send". Please note, attach screenshots to better ensure an answer for your inquiry. This will help resolve the issue your experiencing.